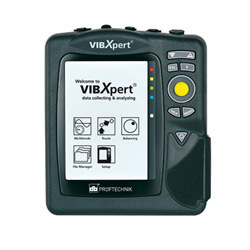 Our VIBXPERT is a high performance, full-featured 2 channel FFT data collector and signal analyzer. This instrument is most frequently used by our engineers on medium and low speed machinery running on rolling element bearings, such as found in the petrochemical, pulp and paper industries. 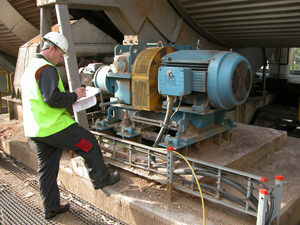 - Analyzing vibration problems in harsh environments, such as wind turbines and harbour cranes. 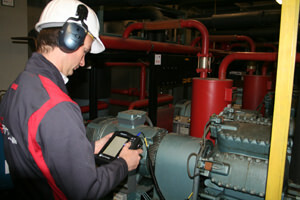 More and more customers are changing from scheduled maintenance towards a condition based maintenance program. 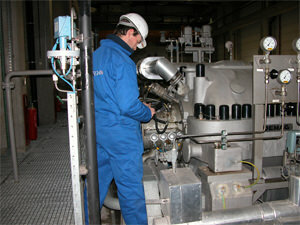 Predicting or monitoring the condition of machinery becomes therefore very important. Hundreds of job are performed by our engineers to predict the condition of all sorts of gearboxes, such as wind turbine gearboxes, crane hoisting gearboxes, extruder gearboxes, etc. With the use of our instruments and our extensive experience we are able to predict the condition of the gearbox with maximum reliability. 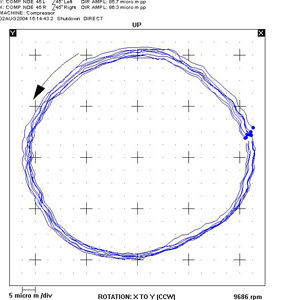 A rolling element bearing inner ring defect was identified in the plot below. Overloading or other process related incidents could create local damage to the gears. 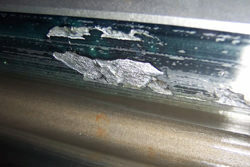 In some occasions this damage will create noticeable impacts during operation of the gearbox. 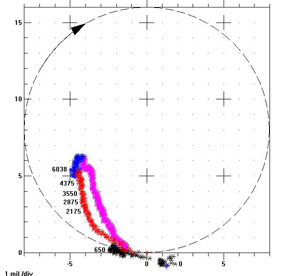 To identify the specific gear and even the specific tooth causing the impact we used our portable data acquisition system in combination with an acceleration sensor and a keyphasor. 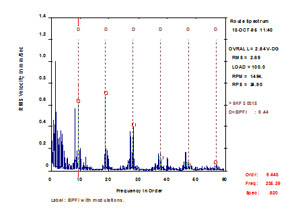 The plot below shows the result when collecting the data. 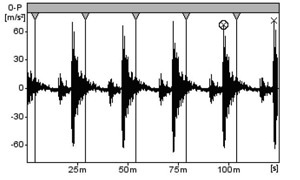 The dotted line represents the passing keyphasor (trigger) mark, while the impact is shown by a spike in the signal. Calculation of the exact position of the impact is now possible. 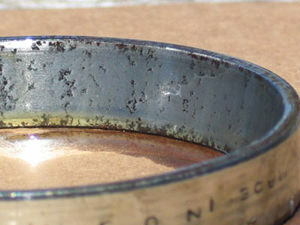 Sometimes hand grinding is enough to remove the burrs caused by an indentation. 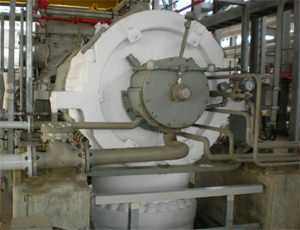 In other occasions it was necessary to re-grind the gears by a specific gear grinding machine. Gear damage is often a secondary effect of another problem, such as overloading, misalignment between the gears, degraded lubrication oil properties, ect. The progression of gear damage, such as micro pitting could be stopped if the root cause of the problem is found and corrected in time. By recording the gearbox casing vibrations we were able to identify the particular gear that was causing the increased vibration level. In this case the damage was too severe and the gear had to be re-placed. In other cases however with minor damage it might be sufficient to replace the bearings when excessive bearing clearance is the root cause. A customer noticed a sudden increase of the shaft vibration level on their Bently Nevada vibration protection system. The customer contacted us to identify the root cause of the problem and if the problem could be solved without major down time. 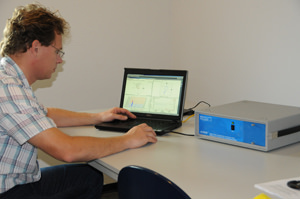 Our ADRE system was connected to the customers protection system for advanced diagnostic capabilities under different operational conditions. The recorded data had all the characteristics of unbalance. The vibration level was related to speed. The frequency was equal to the rotational frequency of the compressor and the orbit figures were circular on both ends of the rotor. It was decided not to balance the rotor in-situ due to the fact that the increase of vibration level happened suddenly, which suggests that something is stuck inside the rotor, broken of or shifted. During dismantling of the compressor it became clear that a piece of strainer had entered the compressor and got stuck within one of the impellers. 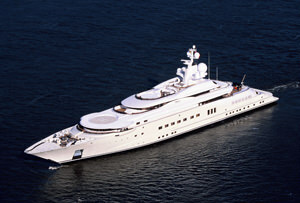 A specific type of yacht had vibration problems which occured at a certain sailing speed. The cause of this vibration is currently under investigation by the ship builder. As a possible cause, the propeller shafts were pointed out. 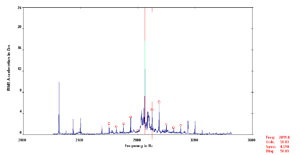 Excessive shaft vibration is thought to excite a hull resonance. 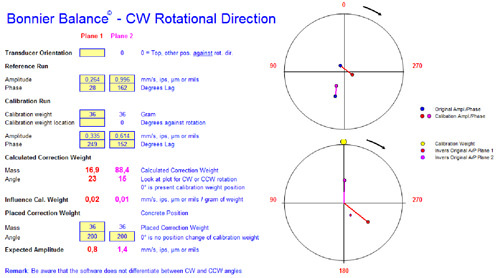 By measuring the displacement of the propeller shaft, we answered the question whether the propeller shaft is causing the vibration problem and under which circumstances it occurs. 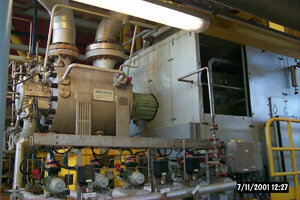 A customer was operating their compressor close to the vibration alarm setpoint. 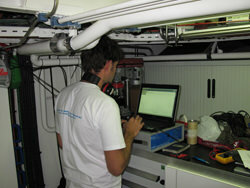 Our engineers were asked to analyze the problem and if possible reduce the vibration level. 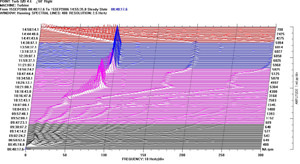 Transient vibration data was recorded with our ADRE system to identify the root cause of the elevated vibration levels. 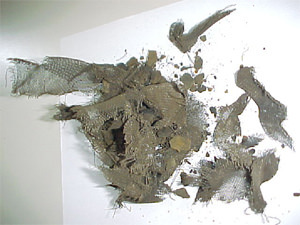 In this case unbalance caused by fouling on the impellers was identified as the root cause. After repeatability of the problem was confirmed and rotor washing did not show any influence it was decided to balance the machine in situ. 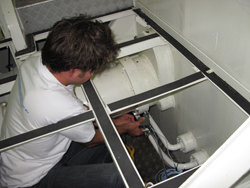 In situ trim balancing is a very cost effective way to reduce elevated vibration level without taking the machine apart.